This university degree course is a complete programme to become a modern barman. Master modern cocktail making and the latest techniques of avant-guard cuisine applied to the preparation of cocktails. An intensive programme with a duration of 2 months, which includes study visits, master classes by prominent bartenders, a final project supported by tutors and work experience in the industry. A study plan that will provide you with a global vision that will enable you to master all the technical aspects of cocktail preparation and understand the business as well as the cocktail bar customer. The degree is jointly awarded by Mondragon University and the Faculty of Gastronomic Sciences of the Basque Culinary Centre. - Graduates in catering, gastronomy and other disciplines who wish to specialise in the cocktail industry and professionals from the sector (bartenders, front of house staff, etc.) with the ambition to progress and acquire new skills. To acquire basic knowledge of the operation of a bar, customer service and team management and motivation. To acquire in-depth knowledge of the main products used in a bar; the key alcoholic drinks (rum, liqueurs and fermented beverages), wine and coffee, from their raw materials to main production areas, manufacturing methods, their properties and derivatives, and service. To master the classic and avant-guard techniques in cocktail preparation. To develop creative and sensory skills to produce signature cocktails as well as their own creations (alcoholic drinks, bitters, etc.). To learn and apply the gastronomic possibilities to cocktail preparation, both to desserts and savouring blends. To define and analyse the production processes (planning, stocks, costs) as a function of the type of service, business model and customer expectations (grand events, shows attended by the customer, cocktails in series, etc.). Positions of bartender or head bartender can unquestionably be undertaken. Adviser to the cocktail industry, brand ambassador for various brands, or the development of new products are other possible career opportunities. *Students will have the option to validate their practical sessions by accrediting competences with previous professional experience. Very practical: cookery shows, tasting of alcoholic beverages, fruits, cocktail shaker training, mixtures, practical workshops and creativity sessions. Master classes run by prestigious guest bartenders. Study visits: there will be a visit to a distillery to experience in situ the distillation and the production process of some of the alcoholic beverages studied in the training modules, as well as other production centres connected to the module content. Project: the creation of a cocktail for a cocktail bar. 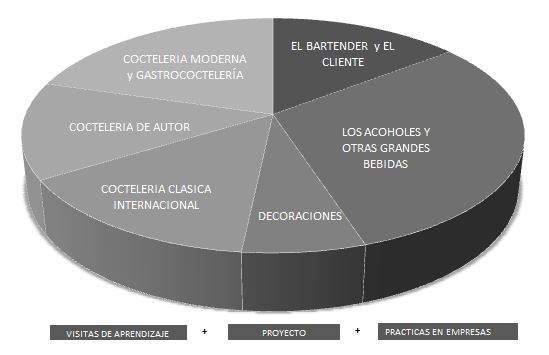 Technical details of cocktails: product, service, blending and costs. The project will be monitored by a tutor. Expert course coordinator and senior lecturer. Patxi Troitiño, Spanish Champion 2009. Cookery, patisserie and front of house tutors for the Basque Culinary Centre. Experts in sensorial analysis and creativity. Experts in the different types of alcoholic beverages and mixes: oenologists, mixologists, bartenders, brand ambassadors, etc. Experts in costs, team management and customer service. During the course, renowned bartenders will share with students their knowledge and experience in the creation of cocktails, organisation of a competition, the secrets of their business model, etc. Javier de Las Muelas. Dry Martini, Barcelona. Pepe Dioni. Vice-President Europe IBA, San Sebastian. Marc Alvarez. BCN5.0 Group, Bar Manager. Carlos Moreno. “Diverxo Vanguardia Líquida”, Madrid. Javier Caballero. “Liquid Experience: Coctelería evolutiva”. Throughout the course, some of these experts and other distinguished bartenders will share their experience, creative methods and the keys to their success. €180 at the time of applying for a place (refundable in full in the case of not being admitted). 40% of the total, that is €1,120 as a reservation fee payable at the time of confirmation of admission. The remainder of the fees, €1,650 two weeks prior to the start of the programme. Documentation to be attached to the application. Registration fee (fully refundable in refundable in full in the case of not being admitted). This fee is 180 euros.